I don't wear my poppy 'with pride'. I won't wear my poppy 'with pride'. I hope I never will wear my poppy 'with pride'. 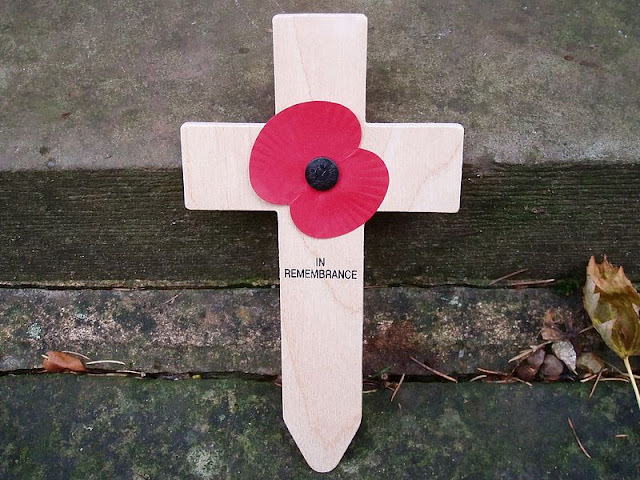 To be clear, I have no objection to wearing a remembrance poppy on on 11 November and Remembrance Sunday, or even for a few days before in this remembrance season. Every year I buy at least one poppy sold by the Royal British Legion in the good cause of supporting the armed forces community and their families. I don't object to wearing such poppies. And yes, when it is appropriate I do wear one. What I object to is the idea often promoted by far-right nationalist organisations (such as Britain First ) that I should wear my poppy 'with pride'. I am not proud that we humans have not yet found a way for wars to cease. I am not proud that so many of the armed forces of many nations on both sides of 'The Great War' should have perished in horrific circumstances. I am not proud that the 1914 - 1918 'war to end all wars' didn't. I am not proud of the suffering resulting from all the wars since 11 November 1918. I am not proud that the arms trade has become so important in the economy of our country, that the UK is one of the world's largest exporters of arms. I am not proud of the memory of the way that governments deciding to go to war thereby legitimise mass murder as heroic, patriotic, or worse still 'glorious'. There is nothing glorious about war. I am not proud that serving and former service personnel whose physical or mental health is damaged as a result of serving the state need to rely on charity when state aid is insufficient. I will wear a poppy with respect for our armed forces serving now. I will wear a poppy with sorrow for so much loss. I will wear a poppy with horror at the ugliness of war. I will wear a poppy with remembrance of those who gave their lives or had their lives cruelly disrupted or taken away. I will wear a poppy with lament and with prayer for peace with justice and mercy on our fragile planet earth. Only just read this . THANKS YOU ARE RIGHT , SO IM GOING TO PUT ON MY FACEBOOK PAGE A WEEK LATE , BUT BETTER LATE THAN NEVER . Thank you Margaret for your comment and for sharing this post on Facebook. I've just taken a quick look at your Filey Gardener blog and liked what I saw there.